BOSTON – This area has a special relationship with the Lerner & Loewe musical “Camelot.” The debut of the musical in 1960 coincided with the election and presidency of John F. Kennedy, and he and his wife Jackie were oft depicted as presiding over a kingdom, much like King Arthur and Queen Guenevere. 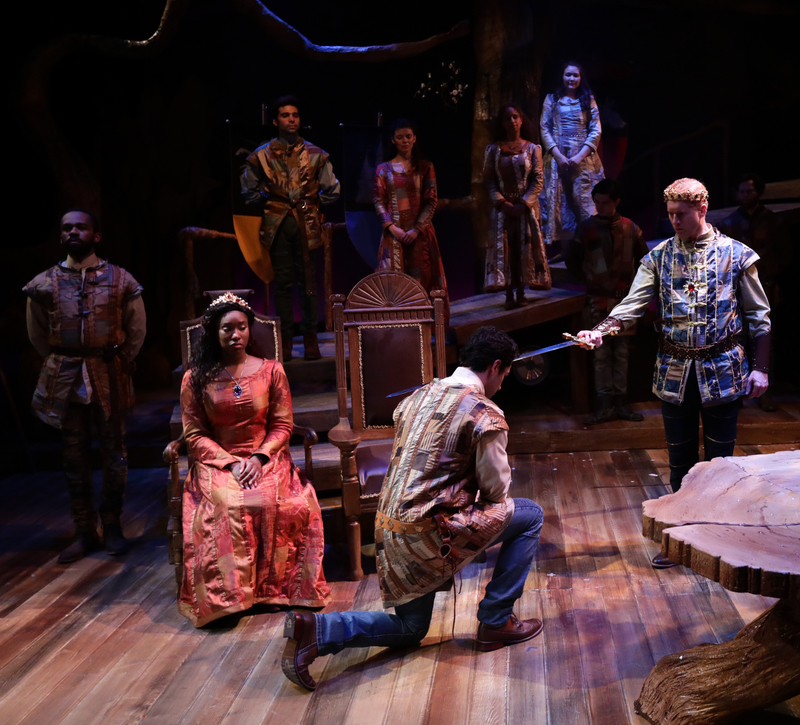 The Lyric Stage Company of Boston is presenting a pared-down version of “Camelot” through June 25, and it successfully focuses on the nonpareil composer and lyricist’s work with a stronger focus on the three principals at the heart of the story. Generally speaking, I’m not in favor of tampering with the classics, but in its full incarnation “Camelot” often threatened to topple over from its own weight; this rendition clocks in at about 2 hours 15 minutes, about an hour less than the full production. 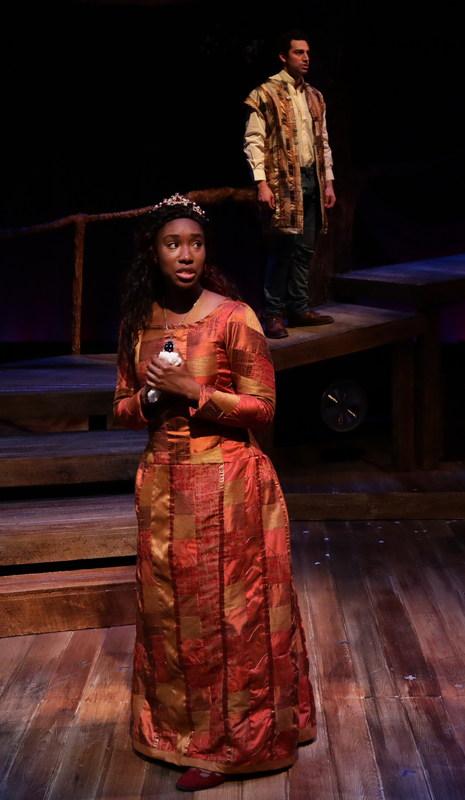 David Lee’s adaptation eliminates some of the pomp and pageantry to get to the heart of the story: a love triangle involving King Arthur (Ed Hoopman), Queen Guenevere (Maritza Bostic), and Sir Lancelot du Lac (Jared Troilo). The piece has also been re-orchestrated by Steve Orich and is being performed by an eight-piece orchestra led by music director Catherine Stornetta, and the songs that have long since joined the Great American Songbook are all here: the title tune, “If Ever I Would Leave You,” and “I Loved You Once in Silence,” to name just three. As adapter Lee pointed out in program notes, the cuts to the book allowed all of the musical numbers to be fully staged. I hereby apologize to Mr. Hoopman, who was so good as Groucho Marx in Lyric’s “Animal Crackers” that I often get that visual in my head. Once I got Groucho out of my head, he was just fine as Arthur, the self-deprecating monarch whose ideals are challenged and who is ultimately forced to choose between the rule of law and the rule of love. The role doesn’t require you to be a great singer; just to be able to put over numbers such as “Camelot” and “How to Handle a Woman” and that he does just fine. Troilo is a gifted comic actor – anyone who saw him in recent roles in “Significant Other” and “Murder for Two” knows that – and he is able to find both the heart and the humor in Sir Lancelot du Lac, the haughty and “pure” knight whose resolve to serve King Arthur and the Round Table is waylaid by his forbidden love for the queen. With the smaller cast and scaled-down production numbers, choreographer Rachel Bertone doesn’t really have a chance to stretch her legs, but the movement is brisk and precise, charming at times, such as with a graceful dance between Arthur and Guenevere and a sprightly “Fie on Goodness,” with Rory Boyd as Arthur’s illegitimate son Mordred leading Sir Lionel (Davron S. Monroe), Sir Dinadan (Brad Foster Reinking) and Sir Sagramore (Jeff Marcus). Garrett Inman, Jordan Clark, Margarita Demaris Martinez and Kara Troilo are the other members of a talented ensemble, which is given a lot to do. With the number of players and characters pared down, there was never a doubt that Lyric Stage Artistic Director Spiro Veloudos – returning to the director’s chair after a life-threatening illness and eventual amputation of a leg – would be able to stage the piece successfully, and with the trims the pacing is decidedly brisker and en pointe. The other trademarks of the Veloudos musical are in full evidence, including strong production values and a respect and appreciation for the work by the creators of the piece. The Lyric Stage Company of Boston production of “Camelot.” Book and Lyrics by Alan Jay Lerner, Music by Frederick Loewe. Based on T.H. White’s “The Once and Future King.” Book Adapted by David Lee. Directed by Spiro Veloudos. Choreography by Rachel Bertone. Music Direction by Catherine Stornetta. Scenic design by Shelley Barish. Costume design by Elisabetta Polito. Lighting design by Karen Perlow. Sound design by Elizabeth Cahill. Through June 25. lyricstage.com.